The Free University of New York (FUNY) was a failed experiment initiated in 1965, to establish an educational social business; The idea of establishing an enterprise with the idea of maximizing improvements in human and environmental well-being, rather than maximizing profits for shareholders. An idea that doesn't sit too well today, in a capitalist ideology. The idea of a "collective educational experiment" was revived again by a group of students and faculty from Brooklyn College, Columbia University, CUNY Graduate Center, Hunter College, New York University, etc. 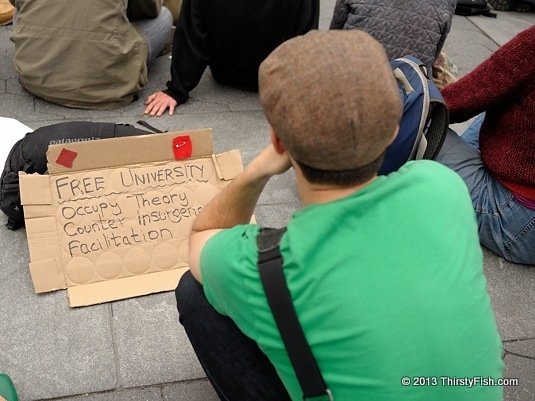 on Occupy May Day last year. So why is Free Education, giving all citizens the opportunity to excel in any field of their interests or capabilities, a bad idea? Throughout the Middle Ages, The Church ran most of the schools in Europe, and laity generally did not have access to education. When educated scholars and scientists, like Copernicus, or Galileo discovered things that didn't fit well with the teachings of the Church, they were at the minimum prosecuted, or in the case of Giordano Bruno and others, burned at the stake. This changed in the Age of Enlightenment, education became more universal and the influence of the Church declined. Generally speaking, it would not be absurd to say that, whichever social class has access to the best education, has a greater influence on their society. In the United States, once the pinnacle of education in the world, access to and the quality of education is on a decline. Part of the reason is that education is becoming more and more expensive, the parents and students struggling to pay for it. In Finland, the education system was restructure in the 1980's with the goal of "providing every child exactly the same opportunity to learn, regardless of family background, income, or geographic location". For pre-K or for a Ph.D., there are no private schools in Finland, yet they consistently rank in the top 3 in the PISA education rankings, while the US ranks in the 20's. A better educated society as a whole could not be a bad thing, could it?